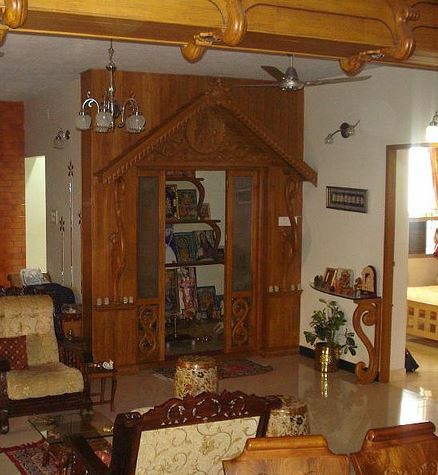 Pooja room designs in wood are most sought after. 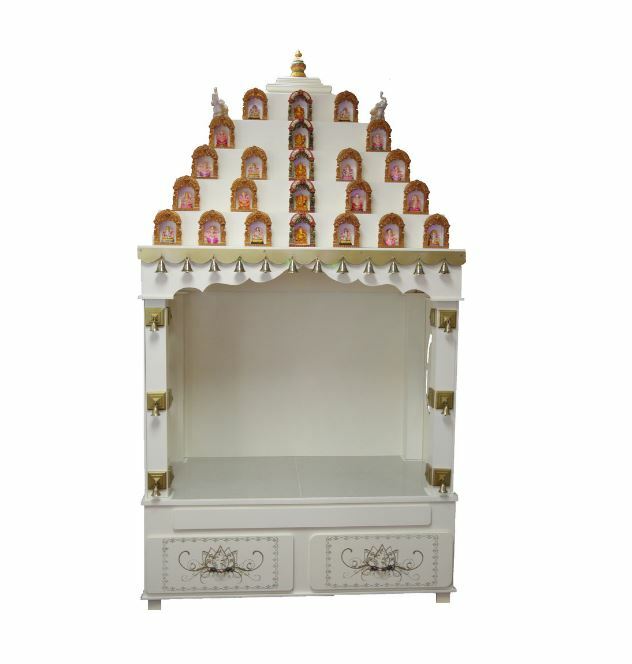 You can either get a wooden pooja cabinet, shelf or a mandap for your home. Pooja room designs in wood are strong, durable and easy to maintain. Place them in your living room, hall or bedroom. 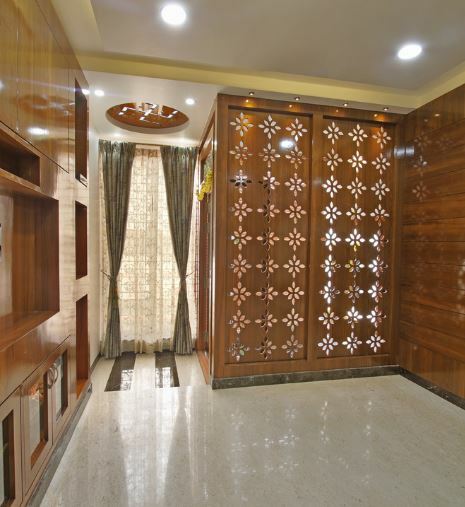 Pooja room designs in wood look elegant and extremely gorgeous. They offer a warm, divine look to the pooja room. 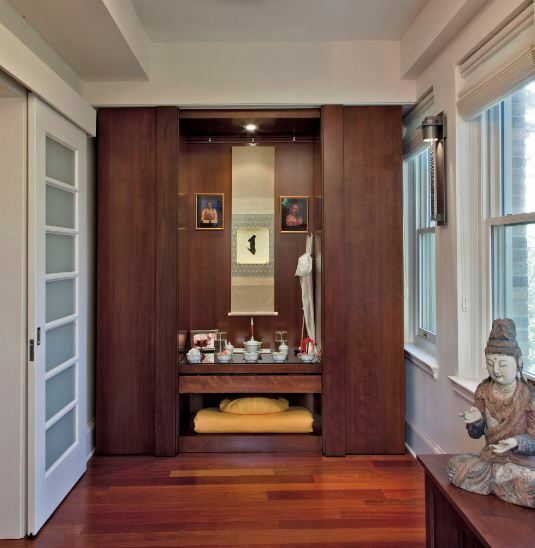 Wooden pooja room bends effortlessly into the decor of the house. Go for these compact pooja room designs. This wooden cabinet with glass rack and door is perfect for living room or hall. Use the drawers to store pooja items. Look at these nice pooja room designs in wood for your dining hall. 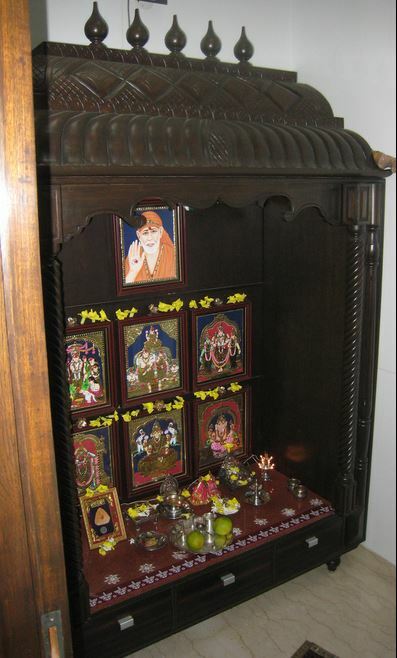 The pooja room cabinet consists of open shelves wherein you can place your deities and offer prayer. 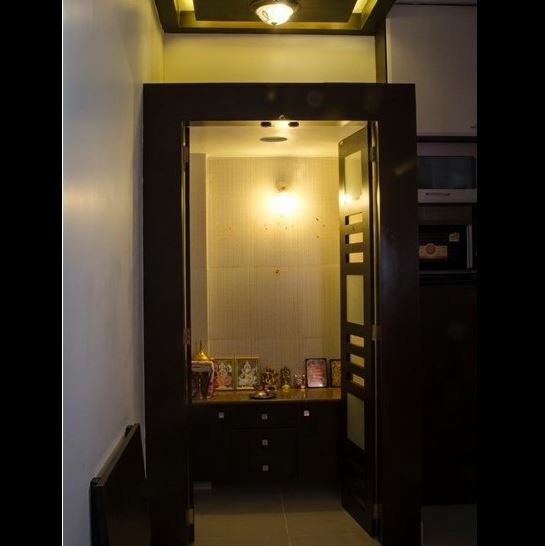 Here is a small pooja room with build-in cabinetry. The cabinets are made of wood; use marble or granite as the countertop material. Get these traditional looking pooja room designs in wood for your home. The intricate carving provides an unmatched elegance to it. If you don’t have space for a pooja room cabinet, then go for a wooden wall shelf. Get a simple pooja room shelf and save on your floor space. This is a very beautiful pooja room mandap design. Place this dark wood mandap in your pooja room and give it a divine look. Use wood to complete your pooja room design. 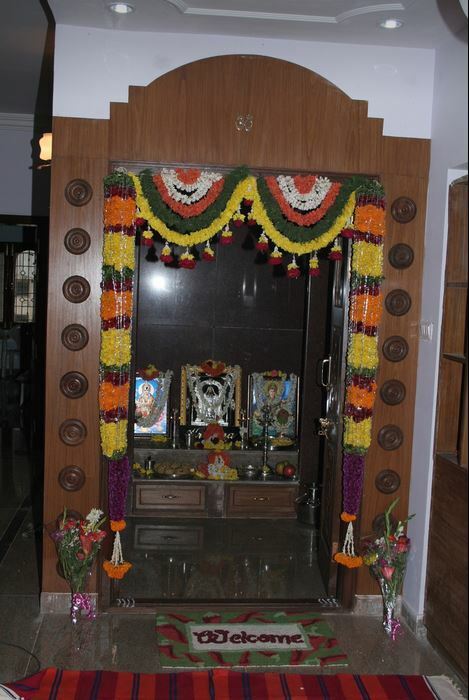 Decorate the entrance of your pooja room with wood. Also, use it to make cabinets, drawers and shelves in your pooja room. 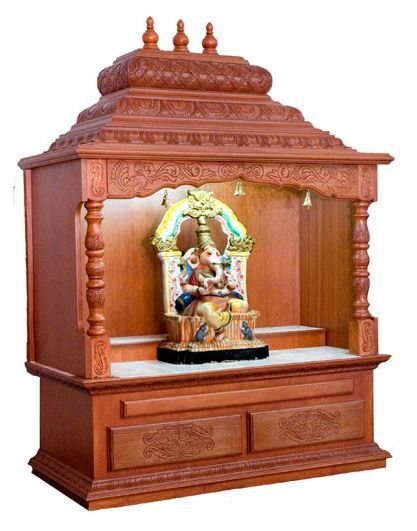 There is a wide selection of wooden mandir designs available in the market. They come in many size, shapes and color. Pick one that fits into your house. You can also buy a wooden pooja room mandap for your flat or apartment. They come in many shades with pretty carvings on them. 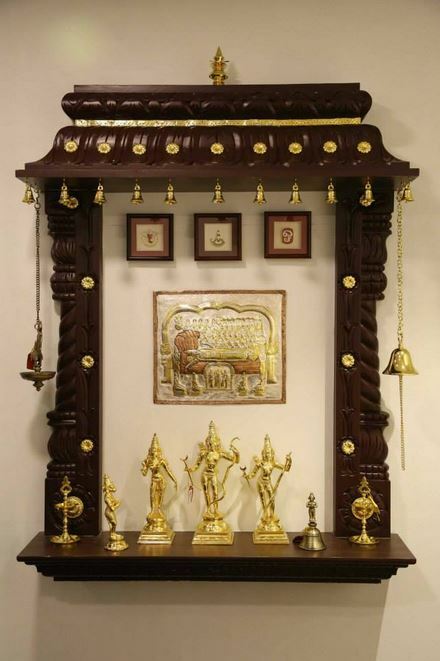 How about this stylish wall mount wooden pooja room mandap? It is stained in dark wood color and decorated with 24 carat gold coating. 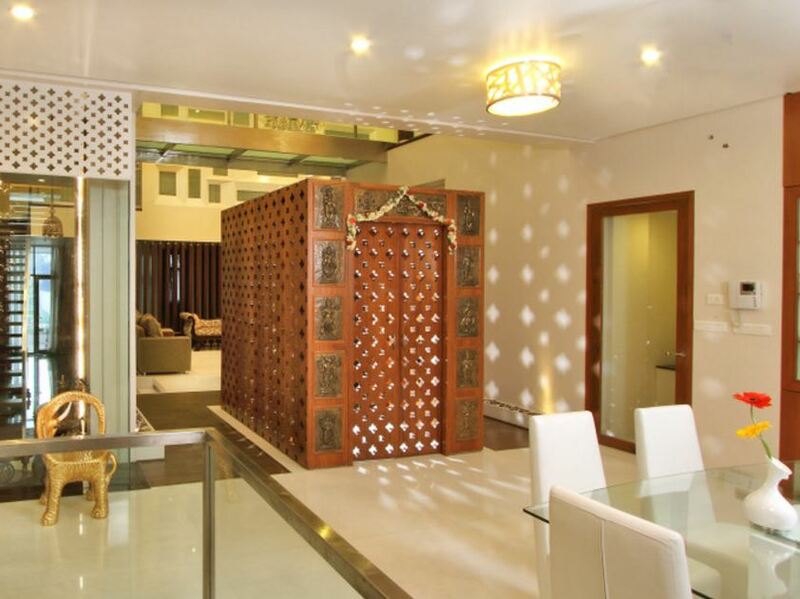 Build this lovely, modern pooja room design in the north-east corner of your house. Create an exquisite wooden frame at the back of the pooja room to give it an open feel. 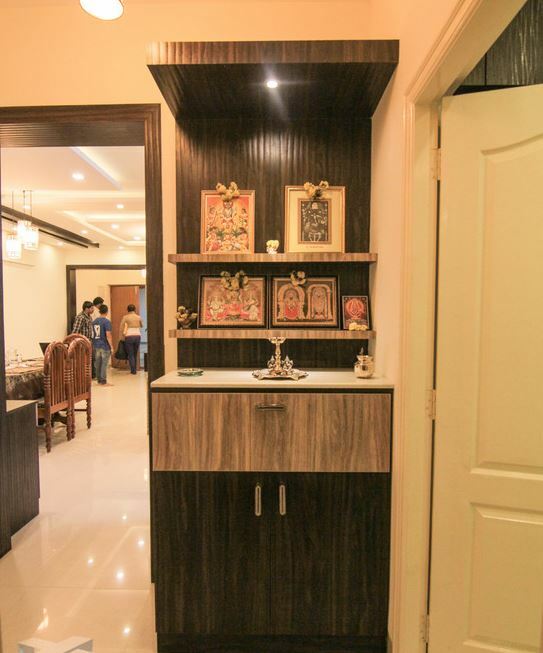 Go for a modular pooja room design. Place the idols and photographs of the deities on it and decorate it with lights, diyas and flowers. 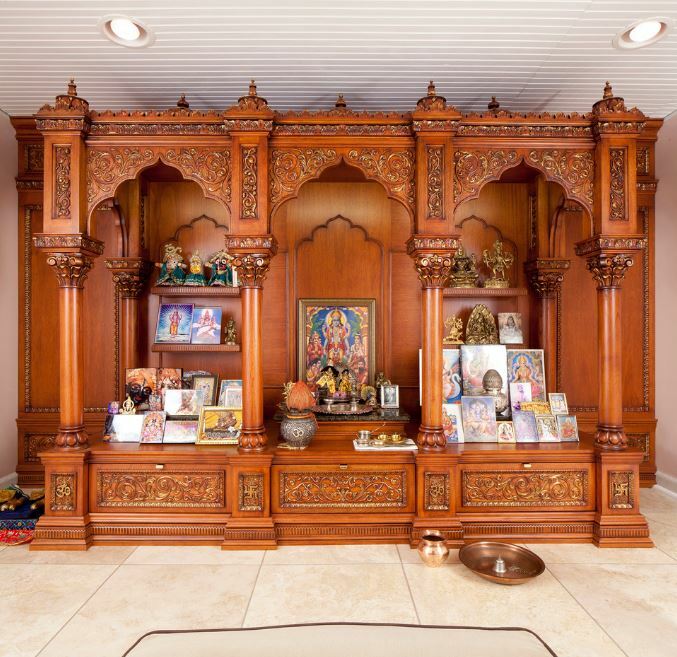 Check out this wood pooja room, it stands in one corner of the hall. You can build this pretty pooja ghar in any part of your house. This is an ideal pooja room design for an apartment. Make this modular structure in your dining room and add appropriate lighting to it. 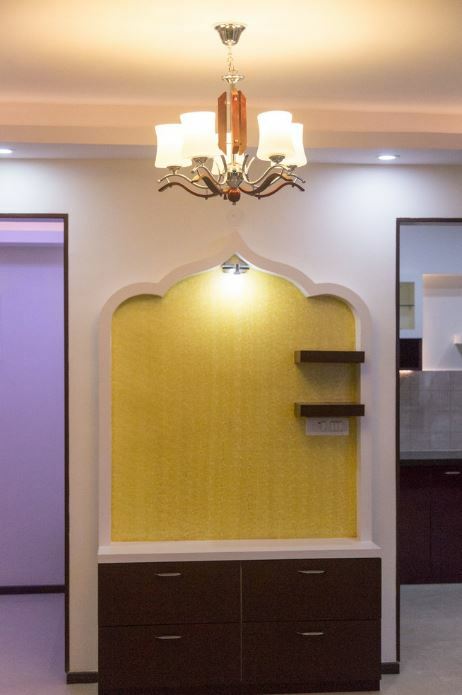 Get this gorgeous modular pooja room interior idea for your home. 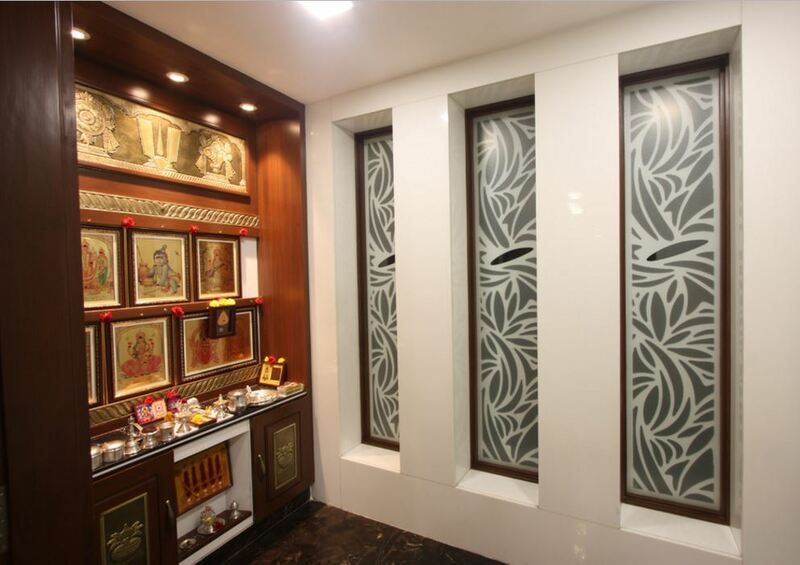 I love the etched glass panels on the side wall; gives a dramatic look to the pooja room. 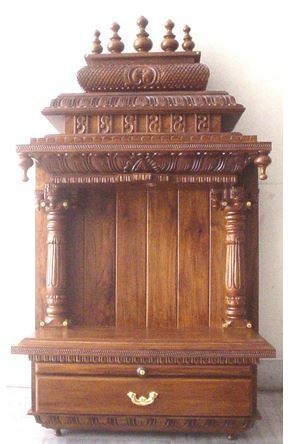 This wooden pooja mandap is apt for small homes and apartments. It is a white painted mandir decorated with bells and has a nice dome on top. 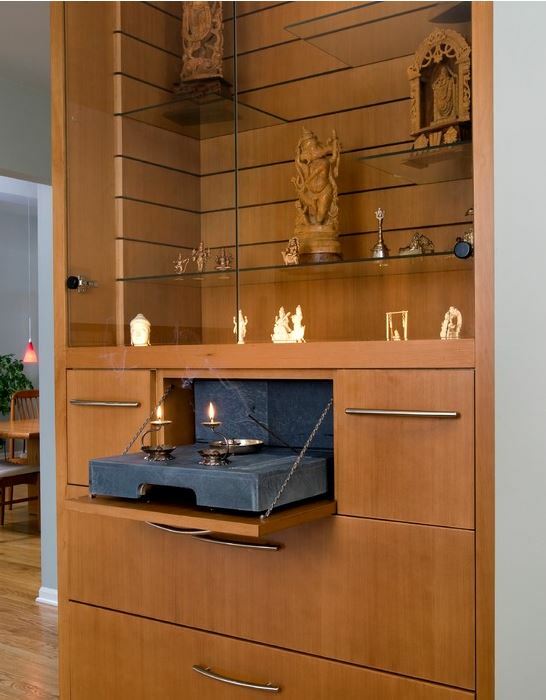 Use the area in between your living room and dining room to set up this wooden pooja mandir. Design a separate space for prayer and meditation. Place your diety in a modular wooden cabinet and the mattress to sit below it. 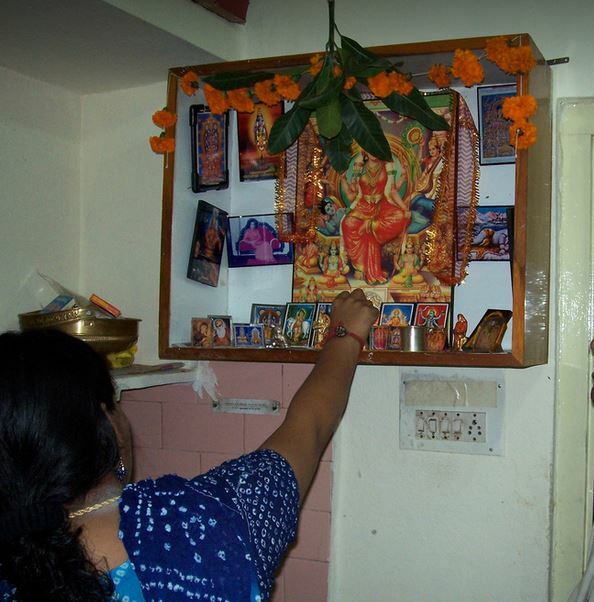 Use the corner of your house to create this awesome pooja space. Make a small cabinet on top to store pooja essentials. Add bells to the cabinet door to get this look. Here is an intricately carved pooja mandap. It is a beautiful custom made, handcrafted pooja mandir in wood. 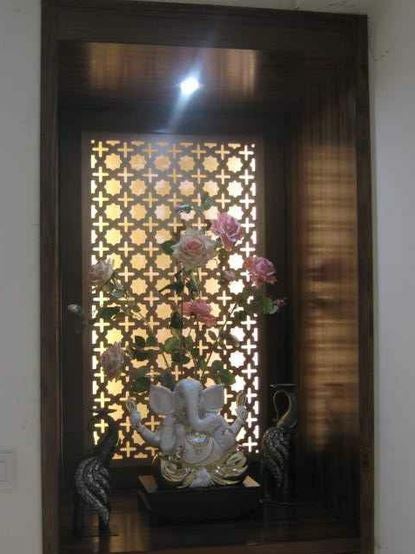 This entry was posted in Pooja Room, Pooja Room Designs and tagged Compact Wooden Pooja Cabinet, Interior Design for Pooja Room, Modern Pooja Room Designs, Modular Pooja Cabinet, Office Pooja Room Designs, Pooja Ghar Designs, Pooja Ghar Designs Wooden, Pooja Room, Pooja Room Design, Pooja Room Design for Homes, Pooja Room Design for India, Pooja Room Design Ideas, Pooja Room Designs, Pooja Room Designs for Indian Homes, Pooja Room Designs for Small Homes, Pooja Room Designs in Apartments, Pooja Room Designs in Hall, Pooja Room Designs in Living Room, Pooja Room Designs in Wood, Pooja Room Designs Kerala, Pooja Room Interior Design Photos, Pooja Room Mandap, Pooja Room Mandap Designs, Pooja Room Mandir, Pooja Room Mandir Designs, Pooja Room Wooden Designs, Pooja Shelf Designs, South Indian Pooja Room Designs, Wooden Pooja Cabinet, Wooden Pooja Ghar, Wooden Pooja Mandap, Wooden Pooja Mandir, Wooden Pooja Room Designs, Wooden Pooja Room Designs Photos, Wooden Pooja Shelf by Homemakeover. Bookmark the permalink. I liked the wooden wall mounted mandir. If I were to purchase a similar model but a little smaller in height with less gold works, what would be the price in nz dollars plus shipment. Hi, I like wall mounted wooden mandir. Could you please let me know what’s the price of the item. 10. 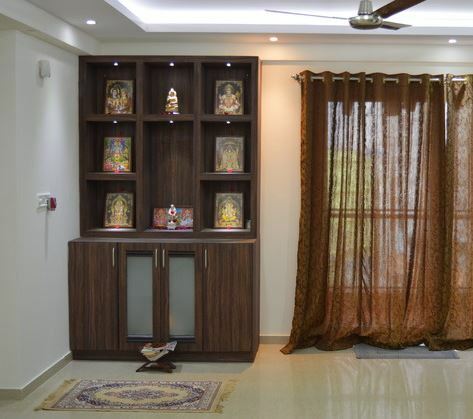 Wall Mount Pooja Room Designs in Wood. what is the cost of it. you can call us. USA shipping can be done or not. Hi I like pooja mandir #10. Please let me know the contact number so that we can call and place the order. How can I buy Pooja Mandir #10? You can order it through mantra gold coatings. How I can purchase Item No 10 and what about the cost.